To move a towed 15 cm artillery piece, the Germans needed a team of six horses and three men to control and look after the horses. The five or six man additional crew rode on a wheeled limber behind the horses. Attached to the limber was the heavy 15 cm artillery field howitzer. 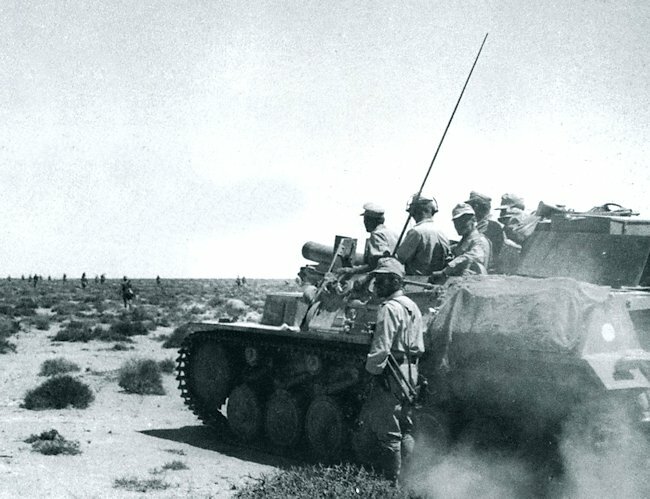 In 1941, Field Marshal Erwin Rommel needed heavy artillery to support his advancing armored divisions in North Africa. Horse drawn artillery was impractical in the heat of the desert. The logistics of supplying these animals with enough feed and water was a nightmare. He demanded a solution be found. The Panzer II tank had performed well in Poland in 1939, but it was out classed by some of the British and French tanks it encountered during the invasion of France in May 1940. This vehicle was considered obsolete by 1941 and was replaced by Panzer III tanks as soon as they came off the factory production line. 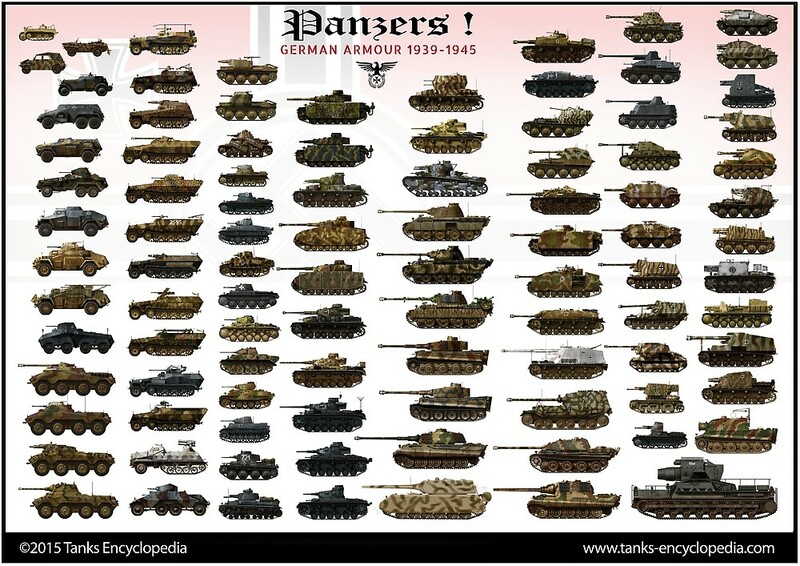 The German army now had a surplus of Panzer II tanks. The decision was taken to remove the tank’s turret and mount in its place a 15cm sIG 33 field howitzer with a gun shield to protect the crew. Rather than having to find a crew of 9 men and six horses to operate one artillery gun, the German army only needed to find four crewmen. It is sometimes called one of ‘Rommel’s Funnies’. 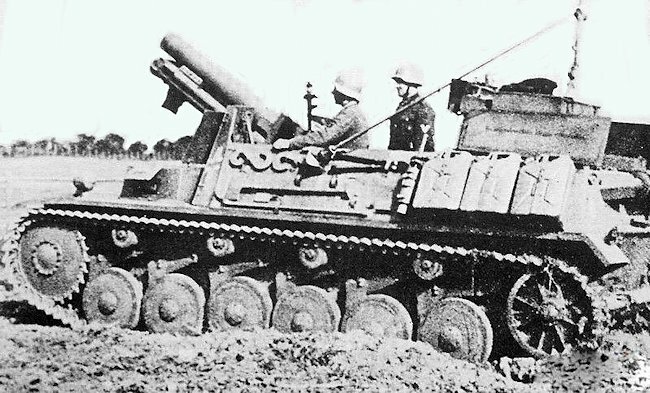 The correct German Army designation for this self-propelled artillery gun is 15 cm sIG 33 auf Fahrgestell Panzerkampfwagen II (Sf) Sd.Kfz.121/122 or 15cm s.l.G.33 auf Fahrgestell Pz.Kpfw.ll (Sf.). While undergoing trials, it was sometimes referred to as the 15cm s.I.G.33 B (this was to show it was an upgrade from the prototype SPG, the 15cm s.I.G.33 A, that used the original five wheeled Panzer II tank chassis and had not yet been lengthened). After World War II, a scale model kit company produced one of the first retail kits of this vehicle. They called it the ‘Bison II’, believing it to be the natural progression for the earlier Bison 1 self-propelled 15cm Artillery Gun based on a Panzer I tank chassis’. This was wrong. It was never called the Bison II during the war but, after the war, the name Bison II stuck. Museums, historical books and other scale model kit companies continue to call this mobile artillery weapon the Bison II. Some authors, museums and scale model kit companies also wrongly call it the Sturmpanzer II. A ‘Sturmpanzer’ is a heavily armored assault tank. It’s crew is protected in a fully armored box, that is enclosed on all four sides and has an armored roof. The front armor of this vehicle is thick to enable it to get close to enemy strong points before firing it’s weapon. This description bears no resemblance to the function and appearance of the German 15 cm s.I.G. 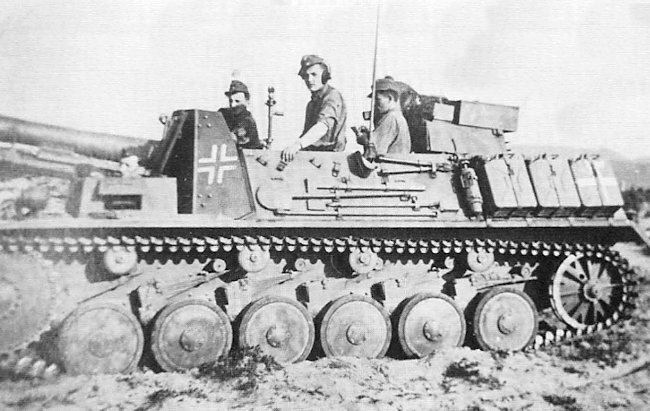 33 auf Fahrgestell Panzerkampfwagen II (Sf) SPG. This vehicle was not designed to advance towards heavily fortified gun emplacements and blow them up whilst under heavy fire. It is only thinly armored and the crew have very little protection. This vehicle was designed to keep up with the advancing infantry and tanks, but remain behind them, out of harm’s way, and fire shells over their heads at enemy targets. 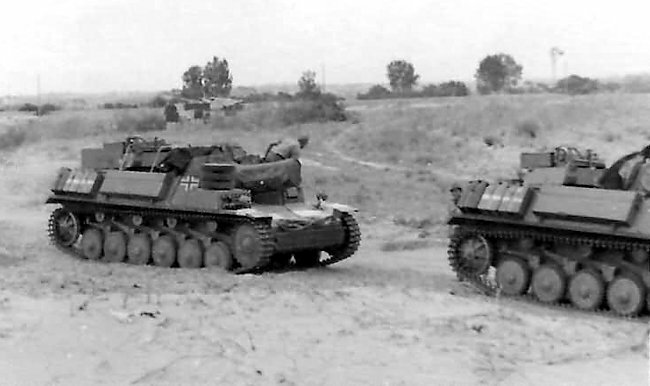 Before the first 15 cm sIG 33 auf Fahrgestell Panzerkampfwagen I (Sf) (Bison I) had been tested in combat in May 1940, the German Army Waffenamt was already engaged in the development of an improved model based on the Panzer II Ausf.B tank chassis, rather than the Panzer I. The prototype was successfully test fired at Kummersdorf on 13 June 1940. A 15cm s.I.G.33 B, without standard gun carriage wheels, had been fitted to a Panzer II tank chassis by Alkett, an engineering company near Berlin. As part of the trials, 120 rounds were fired. 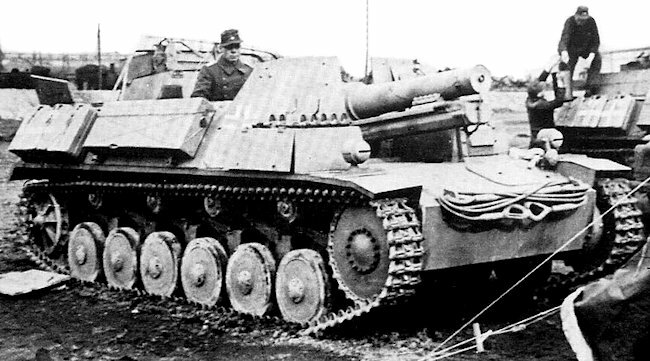 This is a photograph of the 15 cm sIG 33 auf Fahrgestell Panzerkampfwagen II (Sf) prototype. Notice the curved gun shield and five, not six road wheels. The Panzer II tank chassis absorbed the 15cm gun’s highest recoil force of 9 tons firing at all settings and at a rapid rate of fire of up to three rounds per minute. The tracks didn’t noticeably sink into the ground while firing on sandy soil. Several months earlier, a similar trial had been conducted by Alkett. The standard field gun carriage wheels had been mounted on the Panzer tank chassis. This meant it had to be mounted too far to the rear. Firing at the highest muzzle velocity of 240 meters/second at an elevation of about 15 degrees, the recoil force of 9 tons passed through the middle of the last road-wheels, resulting in the Pz.Kpfw.II tank chassis unacceptably tipping backward. After this initial failure, the Alkett design team went back to the drawing board. They took the wheels off the gun carriage and devised new mounts. This meant that the 15 cm howitzer could be fitted considerably farther forward on the tank chassis, which made the vehicle significantly more stable when firing. 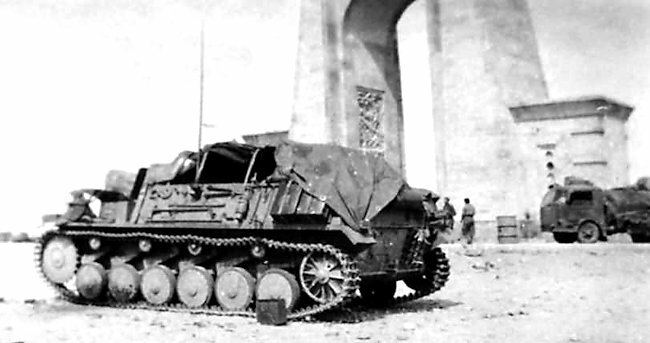 The Entwicklungsstueck (prototype development piece) was completed by Alkett in October 1940 using a normal length Pz.Kpfw.II chassis with five road-wheels. They only made one. 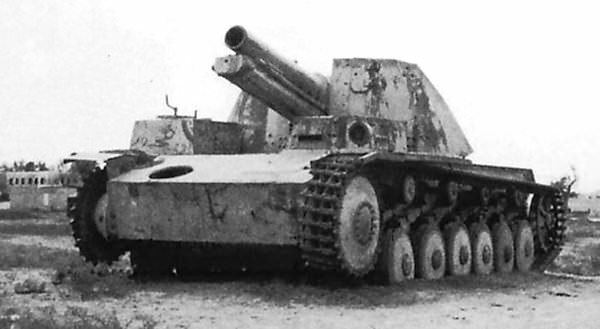 Alkett must have taken this criticism to heart because the Versuchsserie (trial series) of twelve 15cm s.l.G.33 auf Fahrgestell Pz.Kpfw.ll (Sf.) SPGs were produced with a lengthened and widened hull resulting in the addition of a sixth road wheel. Delivery was to start in August 1941. Overall length of the new vehicle was 5.48 m, width 2.60 m, and height 1.98 m (compared to the 4.81 m long by 2.28 m wide Panzer II Ausf.F light tank). Additional space for the fighting compartment was also achieved by mounting the 150 metric horsepower Buessing-NAG L8V water-cooled gasoline petrol engine transversely across the rear. The gun had a 75-degree elevation, but only 10 rounds could be carried on-board. The Germany Army Infantry regiments could call on the support of a large 15 cm caliber towed artillery field howitzer called the 15cm schweres Infanterie Geschütz 33 (heavy infantry gun). They were designed by Rheinmetall in 1927 and were formally accepted introduced into the German military in 1933, hence the designation 33. This long name was shortened to 15 cm sIG 33 or 15 cm s.I.G. 33. About 4,600 were made between 1936 – 45. This gun was not designed as an anti-tank gun. It was normally used to fire high explosive HE shells over the heads of advancing German troops at targets plotted on a map. This is called indirect fire. Occasionally it was called upon to fire at enemy positions it could see. This is called direct fire. The two part I Gr 33 HE shell was filled with 8.3 kg (18 lbs) of pressed TNT with smoke box and standard Zdlg. 36 exploder system. The total weight of the fused round was 38 kg (84 lbs). Unlike anti-tank gun shells that came in one piece, artillery shells were loaded into the gun breach in two separate pieces. The high explosive HE shell was always loaded first and this was followed by the propellant cartridge. The rimmed brass propellant cartridge case, with a c 12 n/A percussion primer was closed at the top by a cardboard closing cap and loaded after the HE shell had been rammed home into the gun. The gun crew had a range chart that told them what amount of explosive propellant to put into the empty brass cartridge case. More was added for longer range targets and less was used to hit targets closer to the gun. The propellant consisted of six removable silk bags numbered 1 to 6 that contained Nitroglyzerin Blättchen Pulver (nitroglycerin flaked powder) or Diglykolnitrat Blättchen Pulver (diglycolnitrate flaked powder). For long distant targets all six bags would be put in the brass propellant cartridge case. For shorter distances fewer bags would be used. The gun could also fire smoke rounds to cover the retreat or advance of an infantry or armored column. These shells were called 15-cm Igr. 38 Nebel and weighed 38.50 kg (85 lbs). These smoke shells were identified by the white letters ‘Nb’ on a field-gray projectile. The bursting charge consisted of picric acid, and the exploder system comprised of a detonator set in penthrite wax enclosed in an aluminium container. The shell produces a smoke cloud 50 meters (55 yards) thick. It had an effective firing range of 4.7 km – 4,700 m (2.89 miles – 5,140 yd). When firing HE shells it had a muzzle velocity of 240 m/s (790 ft/s). A good gun crew could fire three rounds a minute. The shell fuze s.Igr.Z. 23 was a highly sensitive, nose-percussion fuze with an optional delay of .4 second. It operated on impact or graze. It fired two types of HE shells, the 15cm I.Gv.33 and the 15cm I.Gv.38. For all practical purposes they were identical. The gun cradle was situated below the gun barrel. It was trough-shaped and is provided with guide ways, in which guides on the gun move as it recoiled and ran out. On either side at the front was a pad to receive the unabsorbed force of run-out. Between them was the expansion chamber which received the buffer fluid forced from the buffer by expansion as it became heated. Towards the rear were the two cradle arms to which the trunnions were fixed. Each trunnion was provided with a cranked compensator lever which compresses the compensator spring. On 15th September 1941, the German Army Organisations-Abteilung ordered the creation of two new independent heavy self-propelled infantry gun companies: 707.schwere Infanteriegeschütze-Kompanien. and 708. schwere Infanteriegeschütze-Kompanien. These units were sometimes abbreviated to s.I.G.Kp. (mot. S). Alkett completed seven 15 cm sIG 33 auf Fahrgestell Panzerkampfwagen II (Sf) in December 1941 and five in January 1942. Each company were issued with six of these new SPGs. The six vehicles in the 707 were assigned to the Schützen-Regiment 155 and the six vehicles in the 708 were assigned to the Schützen-Regiment 200. Both of these regiments were part of Rommel’s 90.leicht Afrika-Division and fought until the Axis surrender in Tunisia in May 1943. 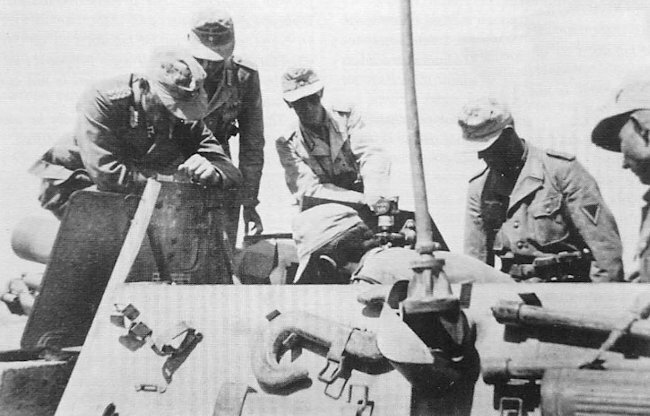 The 12 vehicles did get to Libya in time for Rommel’s assault on Tobruk, due to its postponement from November 1941 until June 1942. On the 23 February 1942, the six vehicles belonging to 708 arrived in Tripoli. Three different ships were used, each carrying just two of the SPGs, just in case of a torpedo or bombing attack. The s.I.G.Kp.707 wasn’t transported to Libya until April 1942. Six different ships were used to transport the remaining six vehicles belonging to 707. The last vehicle was taken of the ship in Tripoli on 24 April 1941. On 9 March, the 708 company commander reported at the division command post that they had arrived in Bengasi on 8 March, but they must remain there for two days to complete various engine repairs. Not enough spare parts had been shipped to North Africa. One of the units NCO’s flew back to Alkett in Berlin to arrange for replacement parts to be shipped out as soon as possible. Mechanical problems were going to plague the deployment of these new self-propelled artillery guns in the desert. The engine had not been upgraded to take the additional weight and cope with the conditions encountered in Libya, Egypt and Tunisia. The Panzer II 155 horsepower engine was too weak for the vehicle weight of 16 ton. The engine cooling system was inefficient for conditions in Africa. In accordance with the driver’s manual, the cooler flaps must be opened while driving. The large amount of dust thrown up by the tracks fell through the open grating and plugged up parts of the radiator reducing the available surface area and its ability to cool the radiator fluid. Engine temperatures became too hot. The transmission and transfer boxes suffered from faults. After a very short running time, sometimes 15 minutes, the engines were so hot that they had to stop to cool them. The pressurized engine coolant reached 120 degrees Celsius after a short running time. Cracks appeared in the track and drive wheels due in part to poor material quality. 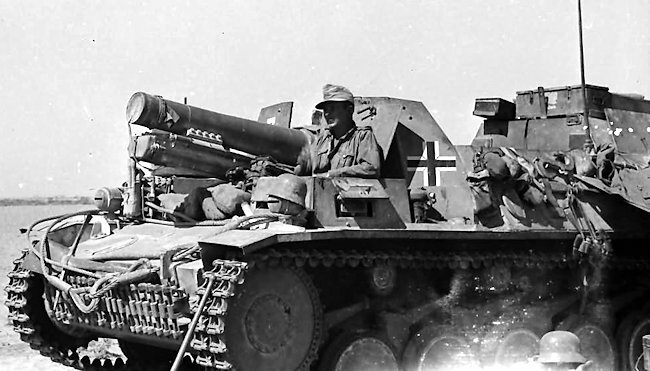 Panzer-Armee Afrika still listed eight 15 cm sIG 33 auf Fahrgestell Panzerkampfwagen II (Sf) as available, but not how many were operational on 23 October. All eight were reported as having been lost by 2 December 1942. 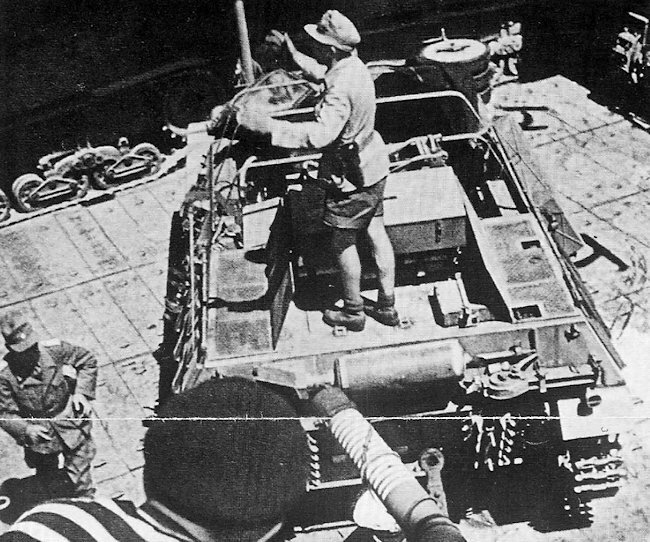 The British reported capturing six of them abandoned during the withdrawal, all in a dismantled condition in a tank workshop. The crew could fit two metal bands across the middle of the open top fighting compartment. They provided similar support as tent poles in a tent. A large canvas tarpaulin tied down at the back of the vehicle could be hauled over these bands and lashed down to the front of the vehicle to give the crew protection from the sun, as well as rain and sand storms. The prototype 15cm s.I.G. 33 A only had five wheels and the normal length Panzer II tank chassis. 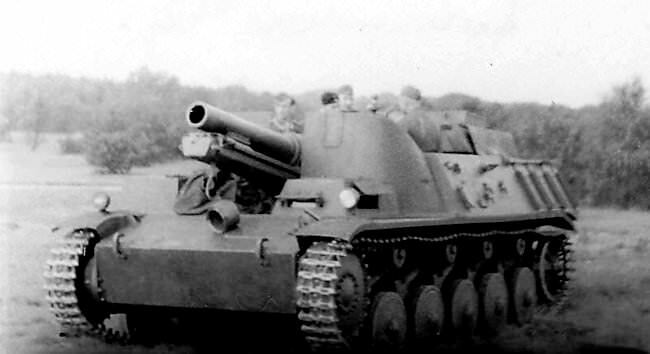 The 15 cm sIG 33 auf Fahrgestell Panzerkampfwagen II (Sf) in grey livery. 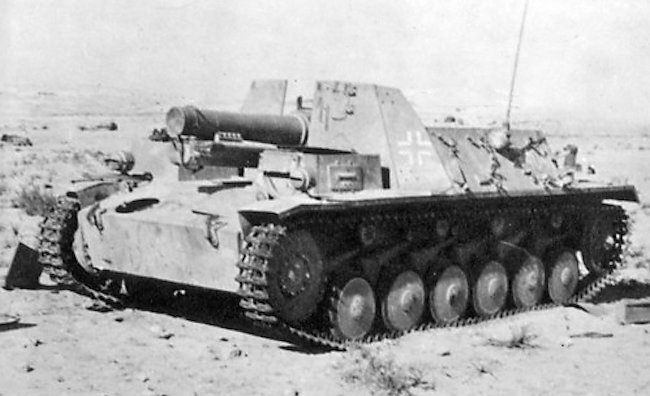 15 cm sIG 33 auf Fahrgestell Panzerkampfwagen II (Sf) ready for active service in North Africa, 1941. 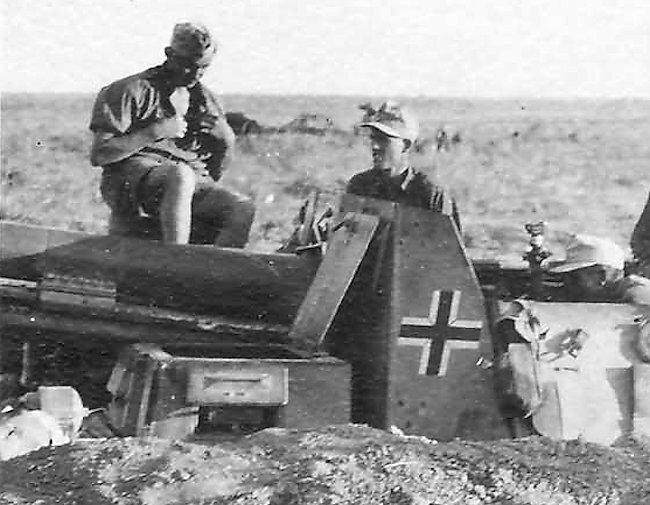 15 cm sIG 33 auf Fahrgestell Panzerkampfwagen II (Sf) with tarpaulin frame erected and sun shade tarpaulin tied on. Why were only 12 built? ‘From the ballistic and destructive effectiveness standpoint, the gun is judged to be outstanding but the Panzer II chassis too underpowered and liable to mechanical breakdown. The troops’ propose that a more suitable tank chassis should be used. I do not agree. The range of this gun cannot be increased. The expenditure is not justified. It would be better to use the 15 cm s.F.H.13 Sfl heavy field howitzer, which has the same caliber but a considerably longer range, on a better tank chassis. 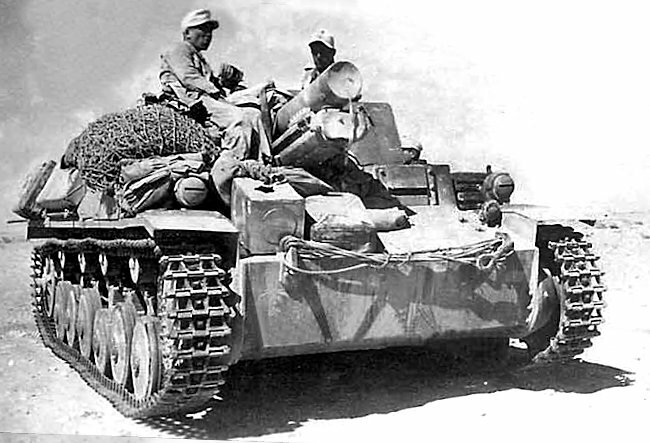 Lessons learned from this vehicle, the 15 cm sIG 33 auf Fahrgestell Panzerkampfwagen II (Sf) Sd.Kfz.121/122 and earlier 15cm and 10.5cm self-propelled artillery guns resulted the design and development of the 10.5cm ‘Wespe’ self-propelled artillery infantry gun. 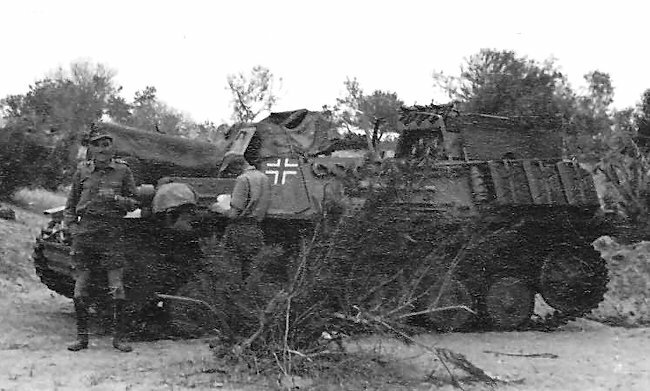 The British Army recovered six 15 cm sIG 33 auf Fahrgestell Panzerkampfwagen II self-propelled artillery guns. They were left in Egypt. The Egyptians recovered one more. It is not known if any were repaired and used by the Egyptian Army against the Israeli Army in the 1948 war or what happened to them after that conflict. If you have any further information please contact us. 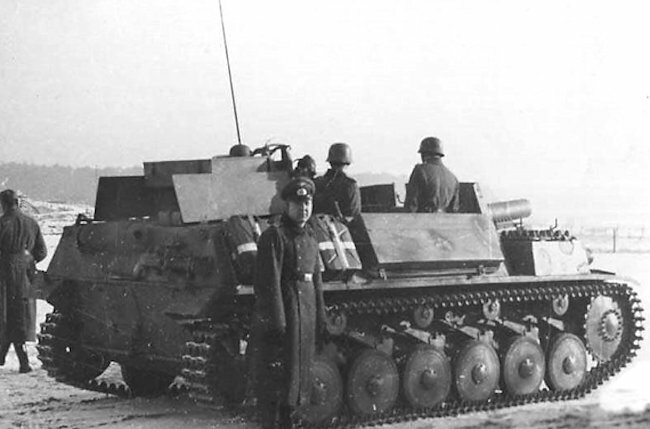 Sturmpanzer II Bison. Achtung Panzer!. A single one was used by Egypt in the Arab-Israeli War of 1948. Interesting to hear, Any additional information (such as which nation used it) would be welcome if you have it. The second paragraph in the intro seems a bit misleading or apocryphal, unless I am misunderstanding. 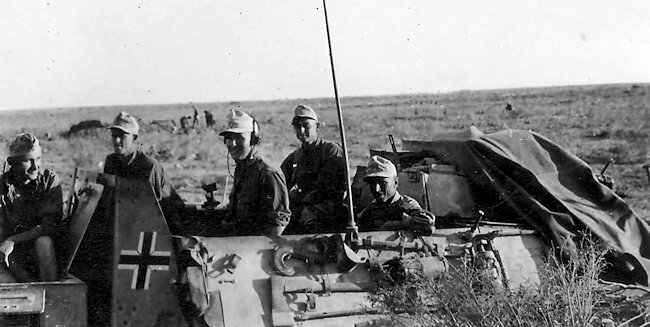 At the time in question, Rommel’s German forces in Africa were Panzer and/or motorized, so horse teams would not have been in the picture anyway. Unless desperately short of equipment, either division type would have had half-tracks, trucks, or off-road cars capable of towing them. The German army used horses for artillery and logistics work throughout the entirety of the war, they didn’t have the resources to motorise their entire force and out of some 264 divisions only 42 were motorised/mechanised. 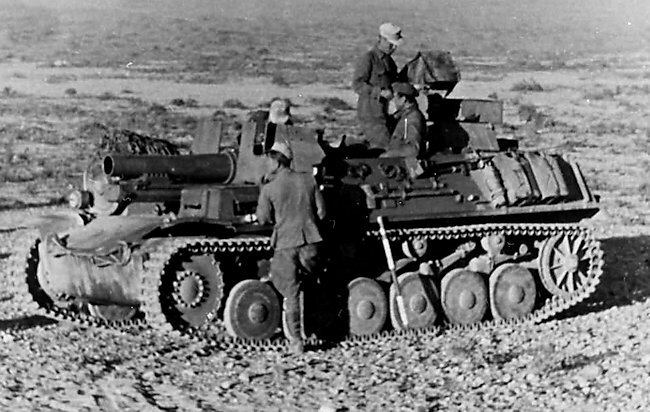 Rommel’s Afrika korps units did have vehicles to tow their artillery and anti tank guns, however most of their guns would have been smaller 105mm guns. the 155mn guns were typically used by infantry divisions who did not have motorised vehicles and had to rely on horses. Hence an extra vehicle was needed for the 155mm guns and a self propelled mounting was chosen. I do agree however that the introduction could be clarified, I’ll speak to the author. Looking at the specifications here I came across an error. The range of the vehicle is stated to be 100 km and its mileage equivalent is stated as 110 miles. This is incorrect. If the vehicle actually ranges 100 km its mileage equivalent should be 62 miles or 62.1. 100 x .621 = 62.1. Unless of course there has been an error in the number of kilometers and the mileage is correct. If this is true then the kilometers would be approximately 177. It is 170 km, you are correct! We are not aware of any incident in which this vehicle fired on enemy tanks. The gun did receive an HEAT round at some point in the war, but I haven’t found exactly when and it is unclear if this vehicle ever received such shells.